From the Plymouth Plantation to the battlegrounds at Lexington and Concord, Massachusetts is a state steeped in history. Boston Region, the capital, is especially rich in sites relating to the American Revolution -- the Freedom Trail connects 16 landmarks -- but features all the cultural diversity and modern attractions one would expect from the sixth largest metropolitan area in the United States. Outside of Boston, Massachusetts is famous for the gorgeous natural scenery of the Berkshires Region and the seaside getaways of Cape Cod & the Islands Region, Martha's Vineyard and Nantucket Island. The sport of basketball was invented in Springfield, which now hosts the Basketball Hall of Fame. Marblehead, north of Boston, is a yachting center; other North Shore Region cities include Salem, site of the notorious witch trials, and the fishing town of Gloucester. Massachusetts is the undisputed capital of American higher education, with numerous universities and colleges throughought the state. The most famous institution is Massachusetts Institute of Technology in Cambridge. In the 19th century, Massachusetts was a manufacturing powerhouse, fueled by the textile mills of Lowell. Today, the economy is dominated by the service sector, and high-tech companies concentrated on the technology belt of Route 128 encircling Boston play an ever-increasing role. 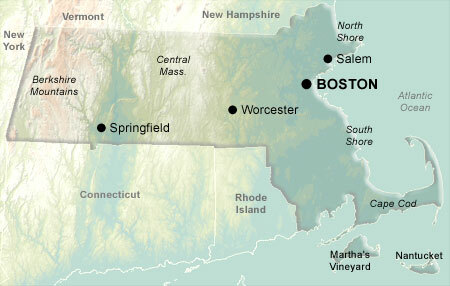 Massachusetts is the most populous state in the New England region. It is bordered by New Hampshire, Vermont, New York, Connecticut, and Rhode Island.